Mike Walker of the National Enquirer reports that Simon Cowell’s girlfriend Terri Seymour was furious and stormed out of the ‘American Idol’ judge’s Los Angeles home when show finalist Kellie Pickler showed as an invited guest to a barbecue he was throwing for pals. Seymour already was upset with Cowell for flirting with the “naughty little minx” on the hit FOX show. 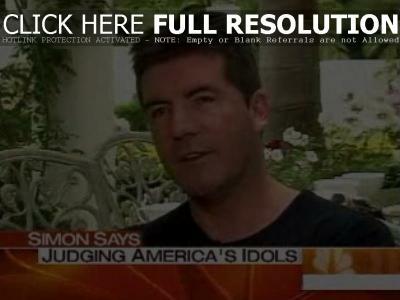 May 10, 2006 – Simon Cowell talked with ‘Today’ show host Matt Lauer about the criticism he hands out on ‘American Idol’, who he thinks will be the final contestants, and some other projects he has up his sleeve. The interview video at Bing.com has since been removed. What’s Next For Paris Bennett? May 10, 2006 – The latest ‘American Idol’ castoff Paris Bennett stopped by ‘Fox & Friends’ this morning to discuss being on the show. She showed off her footwear, her famous gospel singing aunt Ann Nesby, the people she hung out with on the show, offered a 1-word description for the remaining ‘Idol’ contestants, and her pick to win the show. Video at FoxNews.com has since been removed. May 7, 2006 – During a homecoming for ousted ‘American Idol’ finalist Kellie Picker in Albemarle, North Carolina, the singer rebelled against the tight restrictions set by the show’s producers. “I’m going to get in so much trouble for this,” she said, “but what are they going to do kick me off the show?” She then belted out a powerful rendition of ‘The Star-Spangled Banner’. May 7, 2006 – Ousted ‘American Idol’ finalist Kellie Pickler was on the phone with Long Island’s BLI In The Morning to talk with Steve Harper, Dana DiDonato, and Big Randy about her experience on the show. She talked about her first trip to New York, her search for “the Big Apple”, dancing on ‘The Ellen DeGeneres Show’, the allegations that she’s a fake, learning her dad had just gotten out of prison, and more. The interview audio at wbli.com has since been removed.